Anyone who has ever seen a horror or science fiction film from the 50s, or heard "Good Vibrations" by The Beach Boys, has heard a theremin, which was one of the first workable electronic musical instruments. 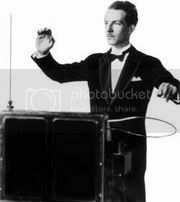 But Theremin: An Electronic Odyssey is more than just the story of a novel noise-making gadget; it's the remarkable tale of Leon Theremin, a electronics wizard whose journey from Russia to America and back again sounds like the stuff of a spy novel -- and it's all true. The strange and fascinating story of Theremin's life is accompanied by newsreel footage of Theremin's career and accomplishments, and interviews with colleagues and musicians discussing the instrument which bears his name, including Beach Boys leader Brian Wilson and Clara Rockmore, who is widely recognized as the instrument's most gifted interpreter (and also Theremin's girlfriend). Brilliant in moments if also flawed, this is a fascinating chronicle of the man who revolutionized modern music with the world's first electronic instrument; impact on movie scores is one of the docu's best parts. Dad I not known that this was a documentary, I could have convinced myself that this was a Woody Allen comedy about a genius inventor of screwball machines. A fine, straight-forward documentary that relates an incredible story. A very very cool documentary on the inventor of one of the most imaginative musical instruments ever constructed - the theremin. Known best for being in the background of the Beach Boys' Good Vibrations, the theremin provides an unlikely partner to the composition of both classical and modern works. A documentary about the creator of the musical instrument, Leon Theremin. It's a story about a man with a passion for electronics and music, a man with an inventive and radical mind. It should come as no surprise that he had a profound influence on the development of electronic music as we know it. The theramin took on a life of its' own. It became the stuff of do-it-yourself kits and a thousand movie soundtracks. You know, that sound that usually accompanies the flying saucer along with the score for The Day The Earth Stood Still? The instrument even co-starred with Jerry Lewis in The Delicate Delinquent. A new generation of fans tested the limits of what a theramin could do, to include The Beach Boys' Brian Wilson and a song we're all too familiar with.